Hifonics 35th Anniversary 2500 watt RMS Brutus Super D-Class™ mono subwoofer amplifier with unique ParaQ™ electronic crossover circuit and diagnostic bass remote included. HIFONICS BE35-2500.1D. At very high listening levels, Hifonics amplifiers with Super D-Class circuitry result in lower distortion, higher current efficiencies and less heat than conventional D-Class amplifier designs. Hifonics BRX3016.1D. BRX3016.1D Amplifier. 3000W Monoblock Brutus Series Class-D Amplifier. Brutus Series 3000W Monoblock Class-D Amplifier. Heavy duty aluminum alloy heat-sink with illuminated Hifonics logo. HIFONICS ZEUS ZXX-1200.1D. Old School Hifonics Heat sink for Superior Heat Dissipation. 1x HIFONICS ZEUS ZXX-1200.1D. POWER @ 1-OHM: 1x 1200W. PRE-AMP CIRCUITRY: Low Noise Pre-Amplifier. Purpose built 1 channel amplifier for driving subwoofers and subwoofer systems. Trending at $115.97eBay determines this price through a machine learned model of the product's sale prices within the last 90 days. Hifonics Brutus BXX1200.1D 1200 Watt RMS Class D Mono Amplifier. The rock solid Ultra-Fi™ MOSFET outputs are selected for both balance and output power. Item Code: BXX1200.1D. Authorized Hifonics Dealer! Old School Hifonics Heat sink for Superior Heat Dissipation. PRE-AMP CIRCUITRY: Low Noise PreAmplifier. Purpose built 1 channel amplifier for driving subwoofers and subwoofer systems. Monitor thermal, overload, DC, and speaker short protection with lighted indicators on the amplifier end panel. Hifonics BRX4016.1D. BRX4016.1D Amplifier. 4000W Monoblock Brutus Series Class-D Amplifier. Brutus Series 4000W Monoblock Class-D Amplifier. Heavy duty aluminum alloy heat-sink with illuminated Hifonics logo. There are several options for installation and the mono Next Generation Super D-Class Brutus amplifiers can run at 4,2 or 1-Ohm as well, for an even tighter bass response! 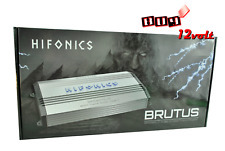 Hifonics Brutus Elite 1200 WATTS, 1 Ohm stable, Super D-Class mono subwoofer car audio amplifier. Hifonics Brutus BXX3000.1D Class D 3000 Watt RMS Mono Car Amplifier. The rock solid Ultra-Fi™ MOSFET outputs are selected for both balance and output power. Item Code: BXX3000.1D. Authorized Hifonics Dealer! Hifonics BXX2400.1D. A good car amplifier is an essential part of any state-of-the-art sound system. Head units can only provide a small amount of power output which may be enough to run your cars factory speakers but this amount of power is inadequate to power a subwoofer or an entire sound system. BLOWOUT! FREE BASS KNOB! FAST SHIP! 3 YEAR WARRANTY! BRX2416.1D - Hifonics Monoblock 2400W RMS Super Class D Brutus Amplifier. Brutus Series Monoblock Class D Car Amplifier. 3-way system protection circuitry (thermal, overload and speaker short protection). Blue illuminated Hifonics badge. 2000 WATT RMS CLASS D MONOBLOCK. HFi Series Single Channel Monoblock Class D Car Amplifier. AMPLIFIER WITH REMOTE BASS KNOB. Why neglect your subwoofer of the high power output it truly demands?. Switch Low Pass 300 Hz. TOTAL CHANNELS. Full Range Class D. CROSSOVER FREQUENCY RANGE. CROSSOVER TYPE. Molex 10 ga. Failure to provide one will result in delays. BASS BOOST. 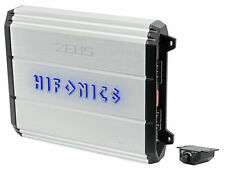 (1) Hifonics Zeus ZXX-2400.1D 2400W RMS Mono Block Class D Car Amplifier Bass Remote. A classic Hifonics aluminum heatsink with a Zeus 2400 Watt, 1 ohm stable, Class D mono subwoofer car audio amplifier. Hifonics Brutus BRX2416.1D. 2400 Watt Monoblock Brutus Series Super Class D 1-Ohm Stable Subwoofer Amplifier - (Brutus 2400 Watt). Brutus Series Monoblock Class D Car Amplifier. Amplifier Series Brutus (Hifonics). HIFONICS ZEUS ZXX-1200.1D. Old School Hifonics Heat sink for Superior Heat Dissipation. 1x HIFONICS ZEUS ZXX-1200.1D. POWER @ 1-OHM: 1x 1200W. PRE-AMP CIRCUITRY: Low Noise PreAmplifier. Purpose built 1 channel amplifier for driving subwoofers and subwoofer systems. Hifonics Brutus BXX2400.1D Class D 2400 Watt RMS Mono Car Amplifier. The rock solid Ultra-Fi™ MOSFET outputs are selected for both balance and output power. Item Code: BXX2400.1D. Authorized Hifonics Dealer! Hifonics HFI1500D. MPN HFI1500D. Condition NEW. Product Details. There are several options for installation and the mono Next Generation Super D-Class Brutus amplifiers can run at 4,2 or 1-Ohm as well, for an even tighter bass response! 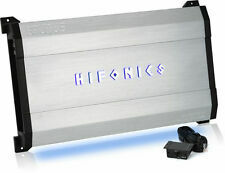 Hifonics Brutus Elite 2100 WATTS, 1 Ohm stable, Super D-Class mono subwoofer car audio amplifier. At very high listening levels, Hifonics amplifiers with Super D-Class circuitry result in lower distortion, higher current efficiencies and less heat than conventional D-Class amplifier designs. This Hifonics Amp is previously owned and in great working condition. L@@K!!! INSANE POWER, CRAZY LOUD !!! Hifonics surface mount design. Max power output: 3200 watts. Mono channel operation. Subsonic filter (24 dB at 15 Hz). Variable low-pass filter (40-300 Hz, 24 dB/octave). HIFONICS GEX-3500.1D. 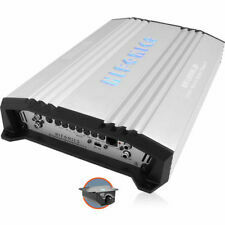 Hifonics Gemini Elite 3500 Watt Mono 1 ohm stable, Super D Class™ mono subwoofer car audio amplifier. Bass remote included. There are several options for installation and the mono Super D-Class amplifiers can run at 1, 2 or 4-Ohm as well, for an even tighter bass response! Hifonics Brutus BXX2000.1D Class D 2000 Watt RMS Mono Car Amplifier. The rock solid Ultra-Fi™ MOSFET outputs are selected for both balance and output power. Item Code: BXX2000.1D. Authorized Hifonics Dealer! Hifonics ZXX24001D. MPN ZXX24001D. 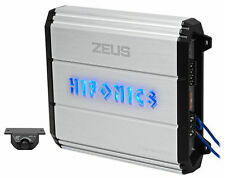 Hifonics Zeus 2400 Watt Mono D Class Amplifier 1 Ohm. Crossover Type. Condition NEW. Subsonic Filter. Bass Boost. 12dB Per Octave. Trending at $164.90eBay determines this price through a machine learned model of the product's sale prices within the last 90 days. Hifonics Zeus ZXX-1800.1D. Class-D 1-Ohm Stable Monoblock Amplifier. CEA-2006 Compliant Amplifier. 3-way protection circuitry (thermal, overload, and speaker short protection). Subsonic filter: 10 - 40 Hz, 12 dB/octave. Hifonics ZXX-3200.1D. Crossover Type. Condition NEW. Subsonic Filter. Bass Boost. 12dB Per Octave. Low Pass Crossover. Variable Electronic. Hifonics Brutus BXX1600.1D 1600 Watt RMS Mono Car Amplifier. The rock solid Ultra-Fi™ MOSFET outputs are selected for both balance and output power. Item Code: BXX1600.1D. Authorized Hifonics Dealer! Titan TXi Series Class AB Monoblock Car Amplifier. Illuminated Hifonics badge. Soft turn-on circuitry. DC, short, thermal, and overload protection circuitry. Put the completed RMA FORM inside the box with your item.